The Arab siege of Constantinople in 717-718, (commonly known as the second Arab siege) is regarded as one of the most important battles in European history. This was the most determined effort by the Caliphs to conquer the Byzantine Empire. Emperor Leo III managed to defeat the besieging Muslims army and navy. This battle saved the successor state to the Roman Empire and allowed it to continue in one form for another for over 600 years. It ended the Arab campaign to conquer the Byzantines and helped to undermine the Umayyad Caliphate. Moreover, the Byzantine victory prevented the Muslims from entering Eastern Europe, therefore preventing the Islamization of the region. Finally, the siege also indirectly led to a religious revolution known as Iconoclasm. The followers of Muhammad had invaded the Byzantine Empire in the mid-seventh century. The Muslims defeated the army of the Christian Emperor at the Battle of Homs. After this victory, the Arabs conquered the Byzantine territories in the Near East and North Africa. A Muslim navy and army besieged Constantinople between 674-678 in alliance with the Avars but were ultimately defeated. There then followed several decades of an uneasy peace, between the two superpowers. However, by 700 AD the Umayyad Caliphs were at the peak of their power and ruled an Empire from Spain to Central Asia. They began large-scale incursions into the Byzantine heartland and also conquered the Christian allies of the Empire in the Caucuses. By the early years of the 8th century, the Umayyad Caliph was preparing for the final destruction of the Christian Empire. Constantinople was the key, and the Arabs knew that they had to capture the city if they were to conquer the successor of Rome. Byzantine had been severely weekend by a series of civil wars and its eastern defenses were crumbling. The Arabs launched a combined land and sea invasion in 716 AD. They followed a coastal route and by-passed many Christian strongholds. To ease the conquest, they encouraged one of the governors in Anatolia to revolt and claim the throne. The reigning Byzantine Emperor abdicated rather than plunge the Empire into another civil war. The rebel governor became Emperor Leo III and is popularly known as Leo the Isaurian. He had agreed with the Arabs that if he became Emperor that he would become the vassal of the Umayyad Caliph. 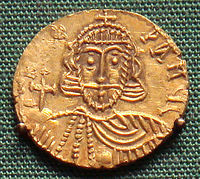 Leo III did not keep his end of the bargain and was determined to keep Byzantine independent and Christian. Enraged the Caliph Umar II ordered his massive army and navy to the vast walls of Constantinople. In Autumn 717 the Caliph Umar II ordered his brother Masalama to besiege Constantinople. He led an army of 80,000 and a fleet of some two hundred ships, mostly oared galleys. The Caliph personally directed the attack from Damascus. Leo III was an experienced soldier and he had strengthened the walls of the city and had stockpiled supplies. He ordered any civilian who did not have three years supply of food to leave the city. The Byzantine navy was able to keep the Bosporus open despite continued efforts of the Arab fleet to blockade the waterway and cut off the city from the Black Sea. The Christian navy had a secret weapon, and this was ‘Greek Fire.’  This was a flammable liquid that could be directed upon the enemy with devastating effects. 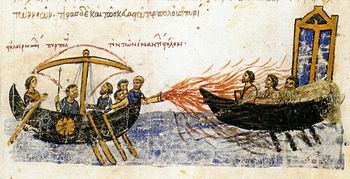 The Byzantines used Greek Fire in a similar manner to a modern flamethrower. This weapon allowed the Christian ships to destroy many Arab galleys. The Byzantines received regular supplies by sea, but the Arabs suffered great hardship, especially in winter. The Caliph sent reinforcements from Egypt. 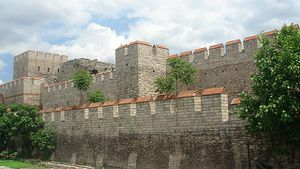 Despite many assaults, the Arabs could not breach the walls of Constantinople. Leo III then entered an alliance with the Bulgars, a Turkish people who had established a powerful kingdom on the borders of Byzantium. They agreed to attack the Arab forces besieging the capital of the Christian Empire, in return for payments of gold. In the summer of 718 AD, the Bulgars attacked the Arabs and destroyed a 5000-strong foraging party. The Umayyad forces were almost trapped between the walls of Constantinople and the Bulgars. The Caliph ordered a retreat from Constantinople but during this, the Bulgar Khan's forces massacred some 30,000 Muslim soldiers before they could board the ships. The Byzantine navy pursued the Muslim navy and destroyed many galleys, many more Muslim ships were lost in a storm. The siege was a complete victory for Leo III and the Christian Empire. Moreover, he had saved the Byzantine Empire. He had displayed extraordinary leadership and had inspired the defenders to resist the repeated assaults on the walls of the city. He and his navy and army were heavily outnumbered by the Arabs, but Leo's tactics kept the Muslims at bay for two years. If the Umayyad forces had been able to capture the city known as the New Rome the Byzantine Empire would have almost certainly collapsed. Constantinople was the focal point of the Empire. The bureaucracy in the city helped to keep the very diverse Empire together. While the metropolis was at a centre of the extensive trade network that bound the Empire together. Moreover, the city was the military and naval stronghold of the sprawling Byzantine realms, if Constantinople had fallen the Empire would have been left defenceless. The defeat of the Arabs outside the walls of ‘New Rome’ saved the Empire, from almost certain destruction. Indeed, such was the enormity of the defeat suffered by the Muslims that they never again attempted to conquer Constantinople. The heirs of Umar II and the later Abbasid dynasty never seriously considered another siege of the great Christian metropolis. The Arabs continued to raid Christian territory but no longer posed an existential to Byzantium. These raids concentrated on securing booty rather than territory. The Umayyad army was weakened in the aftermath of the siege and Leo III began to retake territories that had been lost to the Muslims. The Muslim fleet had been destroyed at Constantinople and it never recovered and the Byzantine regained their old supremacy at sea. The defeat of the Arabs in 718 A.D can be seen as the beginning of a new era for the Christian Empire which saw it expand its territory, economy and cultural and religious influence. The Byzantine Empire was to resist Muslim attacks until it's fall in 1453. It has been described as the bulwark of Europe by many historians. If the Arabs had succeeded in capturing the city, they could have conquered the Christian Empire and used it as the gateway into Europe. At this time Eastern Europe was largely tribal and pagan, but the Byzantine Church was slowly spreading its influence, especially in the Slav and the Bulgar realms. Eventually, the Byzantines secured the conversion of the peoples of the Balkans and later Russia. The Orthodox churches in Eastern Europe and Russia are the ‘daughter churches’ of the Byzantine Church. Moreover, through the influence of the Greek Orthodox Church, the culture of Constantinople was transmitted throughout Eastern Europe and Russia. 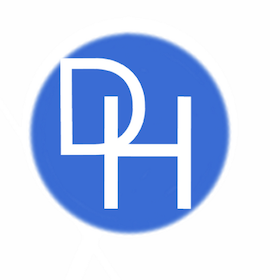 This is evident in the Cyrillic Alphabet and in the art of Eastern Europe in later centuries. However, if the Arabs had been able to capture Constantinople this would almost certainly not have occurred. Instead, the Caliphs armies would have eventually conquered many European territories and as in their other conquests, they would have spread their Muslim faith and Arab culture. It seems likely that Russia would also have embraced Islam. If the Arab army had captured Constantinople much of Eastern Europe and possibly Russia could have become part of the Muslim world. The victory of Leo III prevented the Muslims from entering the Balkans for many centuries and when the Ottomans did, they found that Christianity was entrenched, so much so, that almost five centuries of Muslim rule did not lead to the region, becoming Islamized. For this reason, the defeat of the Arab siege was as significant as the Battles of Tours and Marathon in the history of Europe. It has often been stated that the Umayyad dynasty went into decline after the unsuccessful siege of Constantinople. There is no doubt that the Caliphs had been severely weakened on land and sea. The defeat came at a difficult time for the dynasty as the Empire was also suffering from fiscal challenges. The balance of power after the siege shifted towards the Byzantine. The Umayyad dynasty was so concerned in the wake of the defeat that the considered abandoning their recent conquests in Iberia. 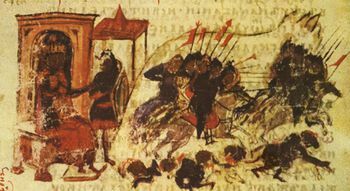 The decline of the Caliphs was underlined at the Battle of Akroinon in 740 when once again Leo III defeated a large Arab force when he annihilated some 20,000 soldiers. The blow to Umayyad prestige was significant and many zealous Muslims claimed that the defeats were because of the impiety of the Caliphs. This culminated in a series of revolts that ultimately led to the Abbasid Revolution when the Umayyads were deposed and almost the entire family massacred. The defeat of the Umayyads before the walls of Constantinople helped to undermine the dynasty. However, they Caliphs had also been weakened by a series of defeats in central Asia and in the Caucuses. It cannot be denied that the failure of Umar II to take Constantinople was a factor in the decline and the fall of the second Caliphate. The Emperor after his victory against the Muslims was viewed as the saviour of the Christian world and his reign began a long and often successful fightback against the Arabs. Leo established a very successful dynasty, the Isaurian (717-802). He used his popularity to reform the bureaucracy, the tax system and reclaimed Sicily from a usurper. Leo was from the eastern part of the Empire, that bordered Arab territories, which was influenced by Islamic theology, especially with regard to its prohibition on representations of the divine image, because it was idolotrous. Many, including Leo, from the east, came to believe that the worship of religious icons, in particular, was idolatry and it was argued by the iconoclasts that this had led to God almost abandoning the Christian Empire. The victory over the Arabs in 718 A.D was also a victory for the Iconoclast party. The Isaurian Emperor believed that his victory was a sign that God favoured Iconoclasm. In 730 AD he prohibited the use of icons and their production, claiming they were idolatrous. This divided the Empire as Greek speakers were in favour of icons while Christians in the East supported iconoclasm. Those who defied the decree on icons were persecuted, often brutally. It also led to the destruction of many priceless works of art, especially icons and statues and Byzantine culture was much impoverished by Leo’s religious intolerance. Iconoclasm was to destabilize the Empire until the mid-9th century, when iconoclasm was finally defeated. The failure of Umar II to capture the Christian metropolis of Constantinople was of immense historical significance. Because the Christian Emperor was able to withstand the Muslim army the future of the Byzantine Empire was secure, and it even expanded and was to survive until the 15th century. The defeat of the Umayyad’s also prevented the expansion of Islam into Eastern Europe at a time when the Slavs and other peoples could have been susceptible to the influence of Islam. Because Leo III had defeated the Muslims he kept them out of Eastern Europe for several hundred years and this allowed the region to become Orthodox Christian in faith and culture. The siege weakened the Umayyad dynasty in Damascus and contributed to their demise. Finally, Leo III interpreted his victory as divine approval for the doctrine of Iconoclasm, which convulsed the Empire for over a century.